This inflatable solar puff harnesses the sun's energy, providing up to 12 hours of illumination. With its sturdy, water-tight sailcloth shell, this bright solar light can weather any storm, while providing up to 12 hours of illumination in three settings. Its 2.6 ounce weight and flat-packable design make it easy to carry with camping gear, in a car glove box, or emergency kit. We've carried these popular lights for several years, and had always imagined UncommonGoods customers using them for camping, or during a power outage. (They also gives light to communities damaged and displaced by disaster. Read more on our blog.) But it turns out that roughing it isn't their only mode. One customer wrote us, "The light is so powerful it will light up the entire cabin of my 39 foot sailboat." We're still waiting for an invitation to check it out. Fabric made in Connecticut. Circuit board and LEDs made in China. Just how bright is this tiny puff? We investigated. Check out our Gift Lab for more. Recommended Storage: 32-82 degrees F.
Outer lantern covering and packaging are PET 100% recyclable . Waterproof covering of PCVA circuit board TPU is 100% recyclable. Do not submerge in water. Place solar panel facing sun for up to 8 hours for 8-12 hours of usage. Charge is most effective when facing direct sunlight. Recharge for continuous usage. Use on road trips, camping, backpacking, or at a centerpiece on the picnic table for an evening back yard get-together! I love this light as a fun outdoor light in the backyard, as an emergency light for the car, and as a closet light...and a camping light...solar, all the way!!! It is great for backpacking and camping. These puff lights are very compact and pretty bright. I like that they are portable and can be used in many locations, either sitting on top of something or hanging from something with the Velcro straps. I purchased a set of 4 as a gift for someone who enjoys the great outdoors. Great lights. Its easy to store and to use. Battery life is long, even in storage. Ordering more now. Most amazing little solar light! Excellent for backpacking! Super lightweight and portable, perfect for around the house in an emergency or for backpacking/camping. It's brighter than I thought it would be because of the LED lights. 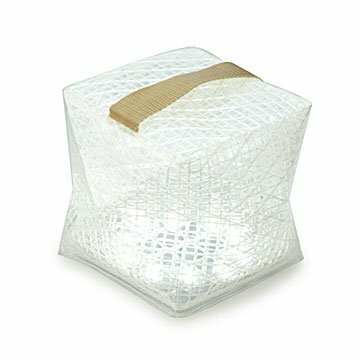 I'm amazed at how this little collapsible cube puts out so much light! Really awesome! This was a fun, inexpensive, versitile gift for our 2nd anniversary. We have already used it on our backyard fire pit grill nights, look forward to using during our travels at many a campsite, and my daughter has used it for play with her friends during sleepovers. The light is bright, and it's charges easily. The controls are easy to find and use, so you only use the light when you need it! My friend camps frequently so I thought this would be a great gift idea.